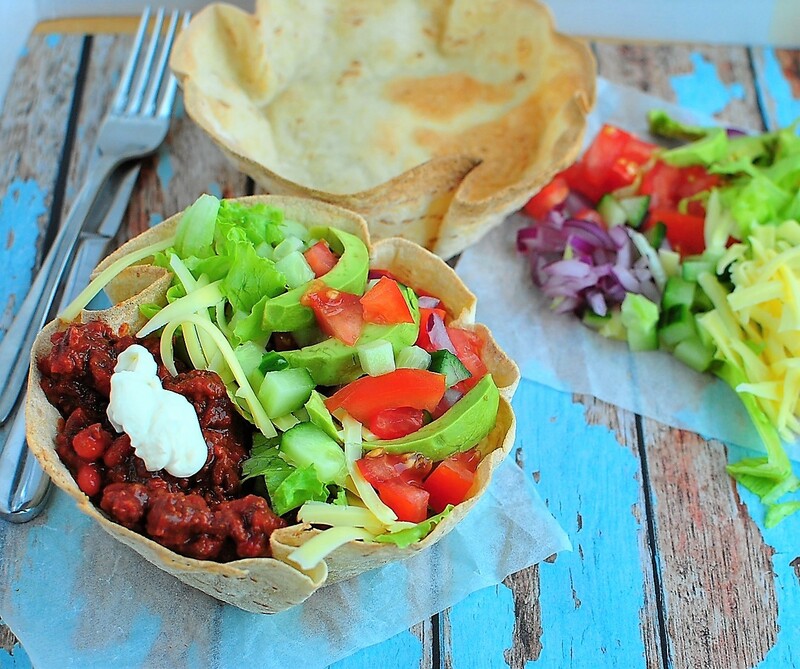 Delicious crispy Taco bowls, filled with flavorsome meat sauce and lovely fresh salad, this meal is a winner any time of the year. What I love about this dish is that it is so interchangeable with so many other recipes, depending on the way it is served. We really enjoy our Mexican food and always have Tortillas in the cupboard, so I generally tend to make a double batch of the mince mixture to have as either these Taco bowls or Chili Con Carne Baskets or have with rice or even make into pies. Once your mixture is made you pretty much have an instant meal that tastes delicious and full of nutrition. You can make your Taco bowls whatever size you prefer, these would be great for game day if they were made in mini muffin tins! Preheat oven to 200°C (180°C fan-forced). Grease 6 individual pie dished or any baking dish you have to make a bowl shape with the tortilla. Stand in trays 5 minutes to cool and firm then transfer to a wire rack. In a medium sized stock pot or large fry pan, heat the oil over medium heat. Sauté onion and garlic until soft. Add beef mince, cook and stir until meat is nicely browned. No Replies to "Tasty Taco Bowls"